This weekend I’ll be driving over to Ellensburg to play 2 dj sets. The first will be for Central University’s 88.1 FM The Burg radio station, via the Friday “Electropolis” show. The show starts at 8, my set will go from 9-9:45, followed by a lil interview. If you’d like to listen in you can stream the show here. On Saturday there will be a monster party in conjunction with the “Show Us Your Shorts” Film Festival Competition, Bar Noir, and of course, Cinco De Mayo. I talked with good friend Cameron Jessup aka Laughing Fox about these upcoming events which he has organized. I’ve included some of the songs you’ll hear in these upcoming sets; tunes from James Arctic, Cedaa, Rubix, Mosca, Strip Steve, Thefft, Distal, Archie Pelago, Hxdb, Artek – all of whom have been on Disco Droppings, or may be in the near future. Here’s a link to the event..
DD Hey Cameron. Happy to collaborate with you once again. You’ve been doing a lot over in Ellensburg..way back when we first met you worked on the college radio with your electronic show, then there was the “Hands” event, and now you do shows at Bar Noir. How is Ellensburg reacting to your efforts with electronic music now, compared to when you first started work there? LF Things have really grown and developed since we last talked. I restarted a monthly dance night at a downtown art gallery, Gallery One, and the events have really taken off. It’s all word of mouth, and yet we still get a packed house of happy, dancing, drink in hand people. I am really enamored with what we’ve created, and its really cool to see the town responding to the event. Outside of what I’ve been doing, electronic music in town has really exploded. While I’d like to say I helped get the ball rolling, a new crop of students and promoters alike have taken it all much beyond what I would have expected this town capable of. Raw Space has a weekly dance party, there have been a few big parties at the fairgrounds, sponsored house parties, and more. It’s a really exciting time to be a head out here. It’s very diverse as well, you have some Top 40 going down, some dubstep, electro, the house/tech house scene that I promote – there is something for everyone now. Even USC Events has gotten in on the Ellensburg scene, as they are now sponsoring my Bar Noir partner Acropora’s radio show on the college station. It’s a great feeling. 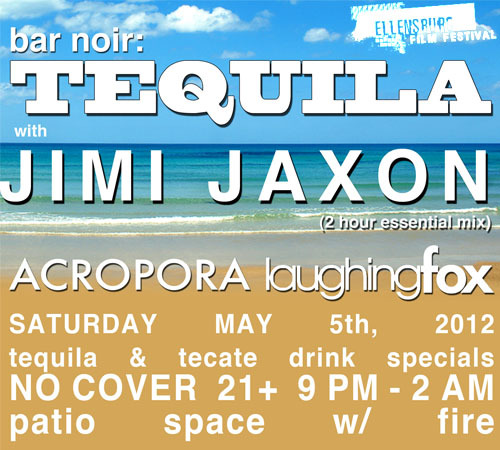 DD Tell us a little about The Ellensburg Film Festival 60 Hour Short Film Competition and you’re new role with the festival..
DD After the awards, Bar Noir will host a special Cinco de Mayo party featuring Laughing Fox, Acropora and myself with a 2 hour set. For my essential mix of sorts, music featured on Disco Droppings, new and forthcoming tracks from 7 Deadly Records and Car Crash Set + other tunes I’ve collected over the years will all be included. What’s this party going to be like? Will there be decorations? LF The Bar Noir should turn out to be a wicked party. We had to take the month of April off due to a large art show that went down at our usual venue, but we’re pulling out all the stops to more than make up for it. I am stoked to have you out to Ellensburg again, and I think our crowd will love your stuff just as much as I do. Decorations will be provided by dual projectors showing behind the scenes looks at the making of the shorts from the weekend, some Latin inspired visuals, and more to create a real festive atmosphere. AND because the weather has really improved, we’re using the patio outside the gallery and will have it lit up with string lights and will have a fire going as well. Cinco this year is going to be a blast. Thanks again for having me on your blog, and see you Saturday Jimi!